Technically, the C Coupé GTE has one of the world’s most modern plug-in hybrid systems. It consists of a four-cylinder turbocharged and direct-injection TSI gasoline engine, an 8-speed automatic gearbox, an electric motor integrated in the transmission housing and a 14.1 kWh lithium-ion battery. The TSI engine produces 155 kW/210 PS, the electric motor makes 91 kW/124 PS, and the combined system gives 180 kW/245 PS and an impressive 369 pound-feet of torque. The concept car can travel up to 31 miles in zero emissions E-mode, at up to 81 mph. It has NEDC combined fuel consumption of 2.3 l/100 km or 102 mpg, corresponding to just 55 g/km of CO2 emissions. The vehicle has a total range of more than 684 miles. Despite being so efficient, the C Coupé GTE is a sporty premium car, with 0 to 62 mph acceleration in just 8.6 seconds and a top speed of 144 mph. The driver can choose between a number of operating modes: Hybrid, E-Mode, GTE and Battery Charge/Battery Hold. Hybrid. The concept car starts by default in Hybrid mode. The C Coupé GTE is a full hybrid, which charges its battery via regenerative braking and automatically utilizes the right combination of TSI engine and/or electric motor according to the specific driving situation. As soon as the driver releases the accelerator pedal, and the battery is sufficiently charged, all drive sources are shut off and decoupled from the drivetrain. This is a special form of zero emissions “coasting”. If the driver decelerates the vehicle and the battery is insufficiently charged, the electric motor operates as a generator and feeds the energy recovered from braking into the lithium-ion battery. In this case, the TSI engine is also shut off and decoupled. E-Mode. In E-Mode, which the driver activates by pressing a button, only the electric motor provides propulsive power. During electric driving, the TSI engine is decoupled from the drivetrain by disengaging the clutch, and it is shut off. As soon as the gasoline engine needs to be used again—due to the battery’s charge state or other parameters—it is smoothly coupled to the drivetrain again within fractions of a second. The lithium-ion battery supplies the electric motor with energy. The power electronics integrated in the engine compartment manage the flow of high-voltage electricity to and from the battery and the electric motor. The vehicle’s 12-volt electrical system is supplied with electricity via a DC/DC converter. GTE. The GTE button—positioned to the left of the shift lever like the E-Mode button—activates the sporty GTE mode. The accelerator pedal, gearbox and steering characteristics are now even sportier. Furthermore, in GTE mode, the TSI engine and electric motor work together in ‘boosting’ which uses the full system power and torque. Battery Charge/Battery Hold. The dual-mode Battery Hold (battery’s energy content is kept constant) or Battery Charge (battery is charged while driving) is activated from a submenu in the infotainment system. This enables zero-emission driving in E-Mode at the press of a button, for example in a city. The concept car is designated a “Coupé” on account of its long flowing C-pillars and tapering trunk section. The C Coupé GTE is painted in “Golden Atmosphere”, a color that was chosen in homage to the Chinese market. In China aspects such as wisdom and tolerance, patience and power are associated with the color gold. The environmentally friendly drive system, the active and passive safety, the superior comfort and the design are in tune with these parameters. Like all new Volkswagens, this concept car is also characterized by extremely sporty proportions. Defining design traits include the strikingly long hood and short overhang, resulting in a powerful and elegant premium-class design. 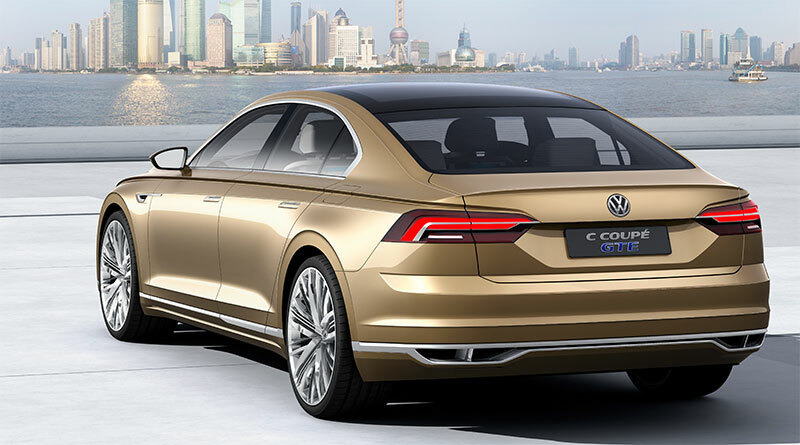 Because the C Coupé GTE is the first Volkswagen to be based on the new modular longitudinal matrix (MLB), the designers were able to further perfect these upscale proportions. The C Coupé GTE is 199.7 inches long, an impressive 76.0 inches wide and 56.9 inches high. Between the short front overhang of 36.4 inches and the rear overhang of 44.6 inches, the concept car sports a long 118.7-in wheelbase. The completely redesigned 22-inch wheels and 265/30 tires combine with the wide front and rear tracks of 64.3 and 63.9 inches for a particularly powerful stance. Horizontal lines and sharp, precise edges are the dominant elements that structure the vehicle. A defining and distinctive feature at the front of the car is the radiator grille that features five chrome bars. The top and middle bars partly frame the LED dual headlights that are integrated in the grille and extend to the fenders. A second large air intake is integrated in the lower section of the bumper and framed on each side by the C-shaped LED daytime running lights, which are a typical distinguishing feature of every Volkswagen with an electric or plug-in hybrid drivetrain. Below the intake is a chrome strip running across the whole width of the car, forming a graphic that wraps around the whole car. Not only has the Volkswagen Design team given the lights a particularly charismatic look, but has also featured exterior ambient lighting for the first time. When the car is unlocked, an elegant lighting display is activated. From the side, a striking character line formed by two creases catches the eye, starting in the front fender and extending all the way to the trunklid. A pronounced double shoulder develops from this character line, extending elegantly across the whole vehicle at the top. The glass roof section connects above the double shoulder. The coupé-like C-pillar is a striking feature: the chrome frame around the side windows ends with a counter curve in this roof pillar, which itself merges seamlessly into the short trunklid. Below the two character lines, the side of the vehicle is characterized by alternating convex and concave surfaces, offset by the large and striking wheelarches that give the concept car a very muscular look. At the rear a horizontal surface structure dominates the design and emphasizes the width of the vehicle. The character lines that go all the way to the trunklid frame the LED rear lights at the top. In the middle the lights feature a light-colored band that also contains the ambient lighting. The rear section is also rounded off at the bottom by a chrome strip that gains in volume as it moves to the back of the car, and is expressively integrated with the exhaust system’s dual tailpipes. The interior, which features wrap-around ambient lighting, has an extremely elegant look. The C Coupé GTE has been designed as a sporty four-seat car to appeal to keen owner-drivers on the one hand while also being an ideal chauffeur-driven car. The dash panel and the interior architecture have therefore been designed with a driver-centric focus, while the rear has a lounge-like ambience. The infotainment concept also follows this theme. 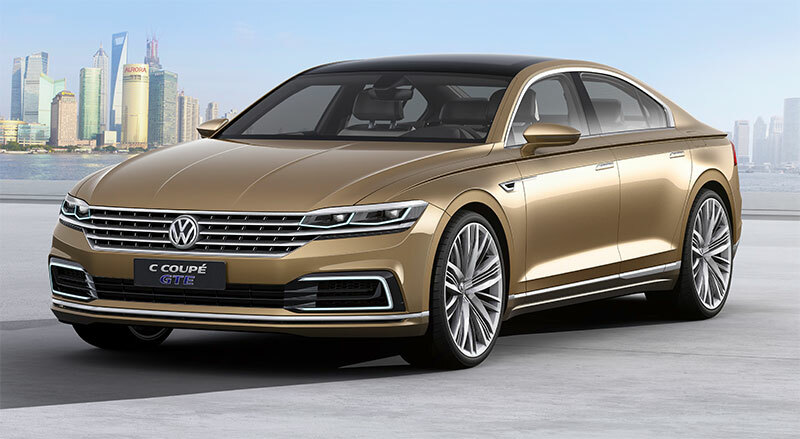 Volkswagen has developed a chauffeur mode where information about the manager’s appointments can be transferred via a smartphone to the infotainment system. This means that the chauffeur has a chronological list of appointments specially tailored to his tasks and is able to provide his boss with further information upon reaching the destination—for example, the exact location of the appointment. Parallel to this, the appointment list also serves to plan the navigation route for the day. However, the chauffeur only has specifically filtered information for the infotainment system to facilitate punctual arrival at the destination. The last part of the route, which will be covered on foot, can be transmitted to the passenger’s smartphone as “Last Mile Navigation”. The architecture of the anthracite colored dash panel (Blizzard Grey) has a consistently horizontal structure. Below the air vents there is Damascus steel trim, produced in a highly skilled process. To make such a part, several layers of steel are placed on top of one another and forged together again. Subsequent lateral or longitudinal separation of the layers enables a specific pattern to be created, which is given a clear structure with grinding and polishing. Running parallel with the narrow line of the ambient lighting, this trim also frames the instruments and is taken up again in the door trim panels. The door panels are refined by wood trim that gives the highly technical interior a warm, natural atmosphere. The Dynaudio loudspeakers in the doors feature aluminum trim that extends across the whole panel and emphasizes the length of the doors. The central clock, which looks as if it is an analog device, also displays information on vehicle status, the assistance systems, infotainment content and the interior air purification system (air quality index). The final element is high-gloss black trim that seamlessly integrates the infotainment system and the digital instrument cluster (Active Info Display). The 12.3-inch central infotainment touchscreen is a sculptural part of the interior architecture. In the “Today’s Schedule” menu, the driver can call up the (filtered) information about the appointments of his rear passenger that were synchronized with the navigation system. The touchscreen is also the interface for the climate control. The instrument cluster is a newly designed Active Info Display with high-definition 3D visuals. The display was designed in such a way that the edges of the virtual space blend into the real border of the instrument cluster, so one sees a free-form surface, which structures the three-dimensional space without perceptible borders by means of the lighting. In its basic configuration, the digital instrumentation has a round power meter on the left and a speedometer on the right. A wide variety of information can be displayed between these two instruments, such as a playlist, current vehicle data and the navigation system’s map. A realistic 3D display of striking or well-known buildings (landmarks) is particularly helpful for orientation. The new free-form surface makes the round instruments appear to hover in virtual space and the graphics of the displays change according to the driving mode (E-Mode or GTE mode). The concept car features a continuous center console that ascends towards the infotainment system between the front seats. The shift lever for the 8-speed automatic gearbox appears to float. The lever is equipped with shift-by-wire control logic: like a joystick, the lever is always in a central position and a short push activates R, N and D. The driver selects the P position with a separate button that is integrated in the lever. In the rear, there are two individual seats that show who the most important passengers are. The rear of the interior is characterized by a lounge-like ambience that features a higher proportion of materials such as wood and leather. The door panels with their wooden elements create a cocoon-like feeling. There are two personal 4.5-inch touchscreens in the center console between the rear seats which are used for individual seat position adjustment and climate control. The rear passengers use a mobile media control unit, such as a smartphone or a tablet, to control the two 9.5-inch screens integrated in the black panels in the backs of the front seats. The 600-watt Dynaudio sound system is also controlled interactively via the media control unit. Privacy in the back of the car is ensured by electrically operated blinds and the ability to darken the panoramic sliding roof via an electrochromic foil integrated in the “switchable” glass. If the rear-seat occupants want a refreshing drink, they are easily accessible between the rear seats in a cooled champagne box.